This women's ring, which I titled Waaban-anang, consists of 14K yellow gold stone settings on a back of sterling silver; the three-prong shank of the ring is made of round gold wire and a twisted wire of silver in the middle. 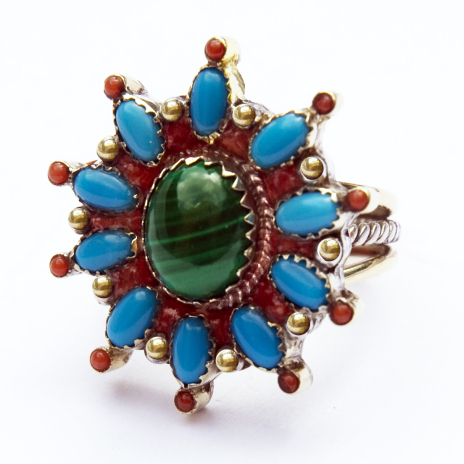 The malachite stone placed in the center of the ring refers to the spring season that starts in the east, the turquoise stones adjusted around the malachite, which symbolize the rays of the morning star, denote Spirit and Morning Prayers, and the red coral inlay and cabochons represent all the stars in the Universe. This ring along with a matching bolo tie, although seemingly counterparts, form a set together, titled Giizhig-anang, the Day Star. Waaban-anang, the Morning star, or Waaban the Dawn, is regarded as a powerful medicine man of the eastern skies, embodying youth and knowledge; this made him the eternal rival of Nigaabii-anang the Evening Star, the equally powerful Grandfather and medicine man of the West. Both stars, Nigaabii-anang (who shines at nightfall) and Waaban-anang (who rises the following dawn) form together one star, named Giizhig-anang, the Day Star – which is known by the name of Venus by most non-Native people. In many an aadizookaan, sacred stories of the Anishinaabeg, Dawn and Evening tot his day live on as Grandfathers who - neither one being more powerful than the other - continue their duels, thus symbolizing the eternal conflicts and dualisms within the human soul and in human society. To read more about the symbolism of the ring please see our Art Blog.